The beautiful capital of Spain‘s Navarre region is full of history and tradition; from the Fiesta de San Fermín, where bulls run through the streets, to the stunning Gothic architecture, Pamplona presents visitors with an immersive cultural experience. The coffee shops in Pamplona emulate just as much history and tradition: here’s our guide to some of the best. Cafe Iruña is one of the best and most famous coffee shops in Pamplona for a true taste of culture, and great quality café con leche (Spanish white coffee). 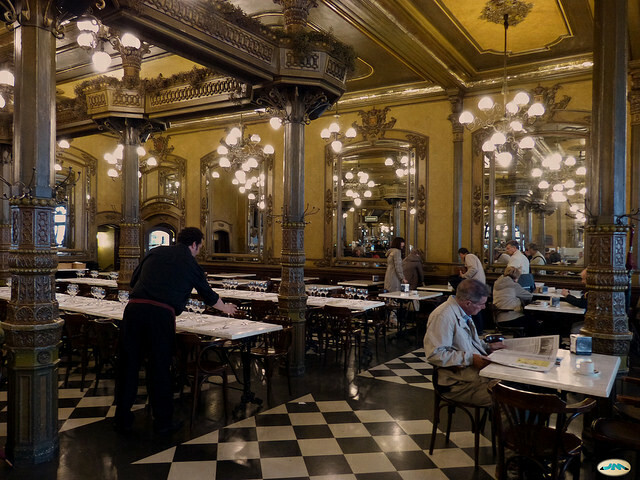 Time seems to stand still at Cafe Iruña, established in 1888 on Plaza del Castilla, one of the most symbolic corners of the old city. The first establishment in the city to have electricity, Café Iruña exudes Spanish tradition in its aesthetic and atmosphere; Hemingway immortalized Cafe Iruña and the city of Pamplona in his novel, The Sun Also Rises. Cafe Roch is located near the Plaza del Castillo, in the heart of the old part of Pamplona. The history and culture of the Navarre capital have been preserved in Cafe Roch, through its decor from years past and its strong emphasis on sticking to tradition in the way they make their coffee and food. This small cafe has become world-famous for their fritos: fried croquettes with a wide variety of fillings. The Cookie Shop is a charming independent coffee shop known for its delicious cookies with inventive flavors, such as lemon chocolate as well as classics, like oatmeal. Located in Plaza Consistorial, guests can enjoy one of the best coffees and cookies to be had in Pamplona as they gaze at the historical Pamplona Town Hall, which has been destroyed and rebuilt several times since the founding of Pamplona in the 15th century. Embracing modernity, Cafe Niza provides a modern and intellectual space for coffee connoisseurs to gather and browse a national paper (or just about any other type of publication) while enjoying a rich cup of coffee. Its clean and modern design and large spacious tables are the perfect place to get work done. The cafe offers a wonderful view of the Plaza del Castillo and the Plaza de Toros. Cafes Bruno promises excellence and quality in its coffee from the initial sourcing stage right through to the meticulous artisan roasting techniques. Roasts come from international sources including Colombia, Ethiopia, Brazil and Guatemala. The quality of their coffee is excellent.